The NU-MRSEC provides the physical and intellectual infrastructure to nucleate collaborative opportunities in materials research both on and off the Northwestern campus, and leverages its diverse portfolio of research into new educational and commercial opportunities. Working with the Center Director and faculty, MRSEC Industrial Outreach Director, Emily Weiss (IRG 1), leads center-wide efforts to coordinate and actively engage in partnerships with industry and other sectors. These collaborations include campus visits, support for students or postdocs, use of Center-supported shared facilities, development of new techniques and instrumentation, and commercialization of Center technologies.Evidence of successful interaction with the private sector is also found in the track record of Center researchers translating important scientific discoveries into highly marketable technologies. Currently, printable graphene inks developed in the Hersam (IRG1/IRG3) laboratory and the fluorophore-particle conjugates (SNAs) developed by the Mirkin (IRG3) laboratory are commercially available from Millipore-Sigma. Center faculty have founded several start-up companies including NanoIntegris, Nanosphere, and Polyera, and they provide advice to start-up companies by serving on their technical advisory boards (e.g., Nanosense, SiNode, and Athena Global Energy Solutions). Finally, NU-MRSEC faculty members have leveraged the success of Center-sponsored fundamental research to receive new corporate sponsored research awards. The NU-MRSEC encourages collaborations with industry for knowledge transfer and facilitates commercialization and entrepreneurial opportunities. For example, the Center has participated in the Design Thinking & Communication (DTC) Course, offered by the McCormick School of Engineering and Applied Science as a requirement for all freshman engineering students, by providing evaluations of design projects through the Segal Design Institute. 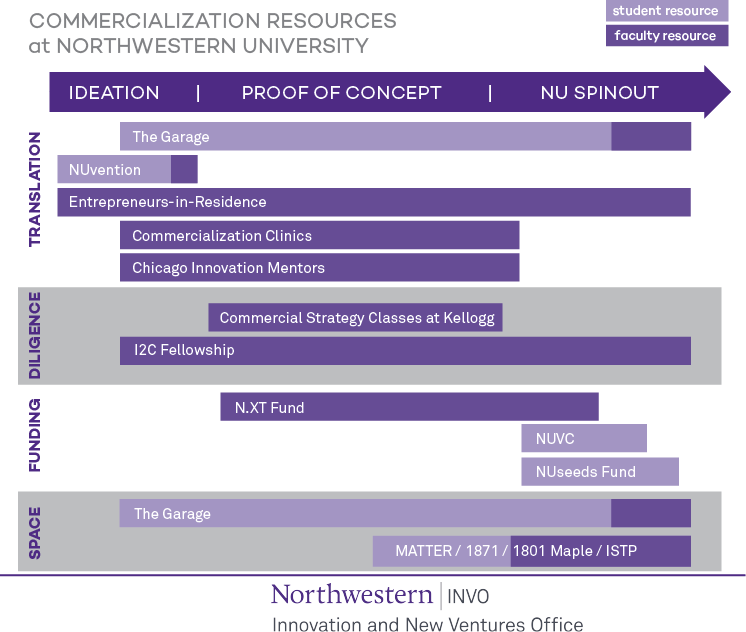 Regular workshops, such as Patenting 101 for Engineers and Scientists sponsored by the Innovation and New Venture Office (INVO) and Northwestern University Postdoctoral Forum, are also offered to all NU-MRSEC students and postdocs. In collaboration with the Farley Center for Entrepreneurship, the Center also participates in the NUvention course, where participating students worked to develop business plans for technologies developed within the NU-MRSEC.